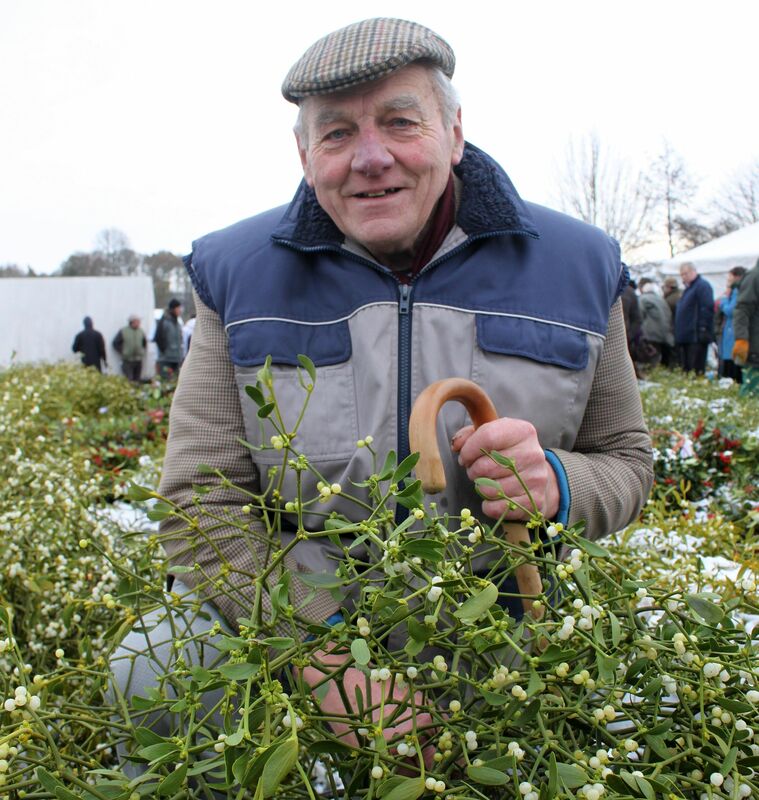 British Mistletoe lost one of its greatest advocates a couple of weeks ago when Stan Yapp, aka The Mistletoe Man, sometimes even The Mistletoe King, of Tenbury Wells died, aged 80. His funeral today, at his local church in Leysters, was attended by hundreds of mourners – of whom I was one, though I did feel a little like an outsider as I’m not local, and knew relatively few people there. It was soon made clear that there was much more to Kenneth Stanley Yapp than just mistletoe – which I had always suspected, but never known. Because, to be truthful, I didn’t really know Stan well – I just knew him as a significant part of the mistletoe scene, which I know will be much poorer without him. Today I learned that he had lived in Leysters all his life – in the same house on the same farm, where he was born. That he had been a Churchwarden at St Andrew’s for 60 years – and was being buried in his favourite spot. He was also active in the Tenbury Show for decades, and more recently in the Tenbury Apple Fest. He was still attending meetings of that until very recently, still cheerful despite having to tow an oxygen cylinder behind him. Stan was always cheerful. I should have known him better – our paths must have crossed many times in my mistletoe work in the 1990s – but somehow we didn’t properly meet until about 2002, despite both being regulars at the Mistletoe Auctions for years previously. Our first proper meeting was to do with some media thing (TV I think – but can’t recall which sort). 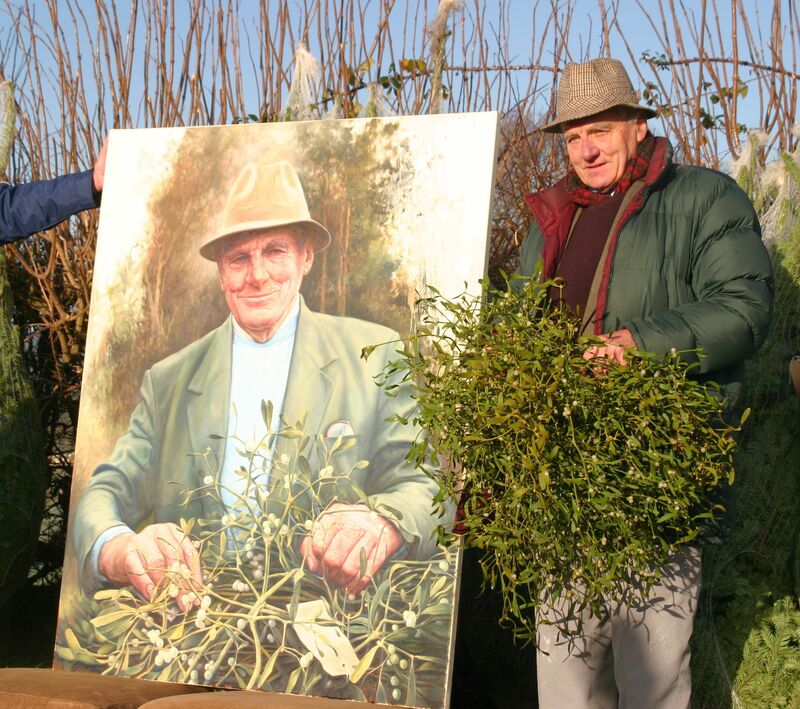 I’d like to say it was dramatic – Gloucestershire Mistletoe Man (me) finally meets Herefordshire/Worcestershire Mistletoe Man (Stan) – but it wasn’t – Stan just made me a cup of tea and we swapped mistletoe stories whilst we waited for whoever it was we were meeting. A little later we were both involved with Tenbury English Mistletoe Enterprise (TEME), a partnership that set up the Tenbury Wells Mistletoe Festival and, alongside real worries that the mistletoe auctions were about to cease forever, the first online retailing of British (always labelled ‘Tenbury’ of course) Mistletoe. That last bit of it, the online sales, wasn’t quite Stan’s sort of thing, but I hope he was aware and proud that we did make it work, and even spawned several competitors, most still going strong. Stan was also a minor celeb! 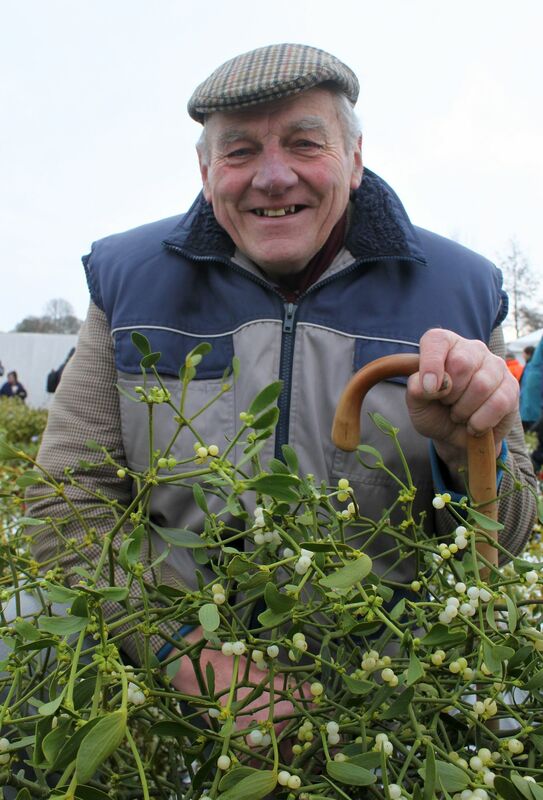 His mistletoe enthusiasm got him significant media attention – numerous TV, magazines, newspapers etc over many years – he even launched the Royal Mail’s Christmas Mistletoe Stamp back in 2002. 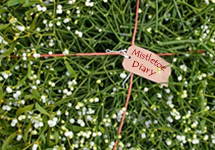 And this all led to attention from all over the world – often being asked to send Tenbury mistletoe to far-flung places. I was so used to always seeing Stan at the auctions (where we always compared notes) that I have surprisingly few candid photos of him – and it may be no coincidence (bearing in mind his media profile) that the only decent pictures I can post here are from batches that I took for media purposes – one (at the top and another I’m posting at the end of this entry) as a favour for a journalist who desperately needed a picture of Stan Yapp ‘today’ one December morning back in 2010. And also this 2007 one (left) of Stan , standing with his portrait (which later hung in the National Portrait Gallery I think). 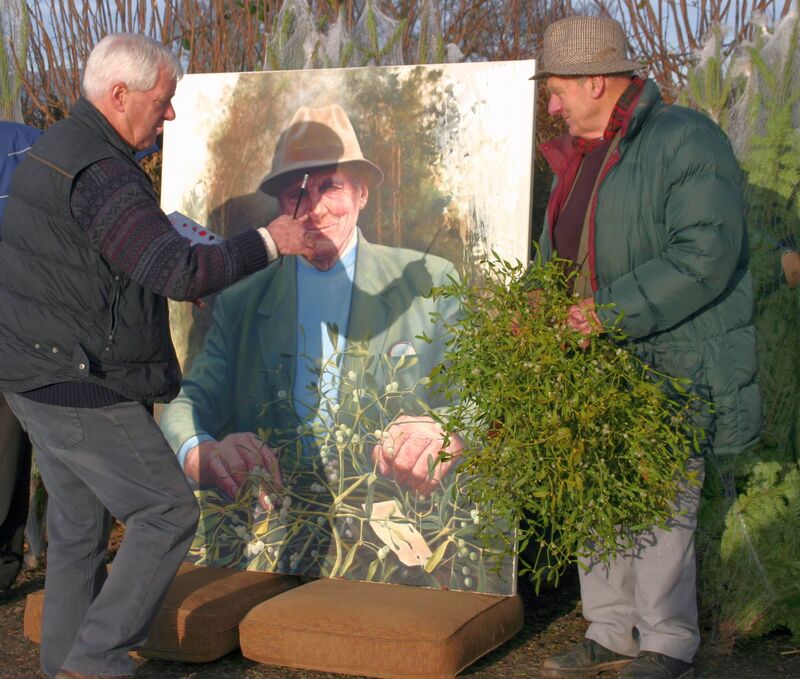 This was taken at the request of the artist Paul Saville, pictured (right) adding some final touches while Stan looks on. Stan was, probably, still looking on today – and, I hope, was pleased with his turn-out. He’ll be much missed. Thanks for the memories Stan. Thanks Jonathan, never got to meet Stan, but truly admire all the work that he put in and his passion for Mistletoe.